Crude oil prices lost traction on Wednesday as escalating political tensions between the US and China brought back concerns over Chinese demand weakening as a result of a long-lasting trade conflict. In addition to that, weekly API report showed a significant increase in US inventories by 9.750M barrel versus an estimate of 0.907M barrel which also weighed on Crude prices in a big way. However, hurricane Micheal - that turned into category 4 - is now expected to damage the oil output from Gold Mexico but we've yet to see the market pricing in this. After retesting the purple trend line, Crude oil prices fell to their lowest level since the end of November at $71.8 per barrel. 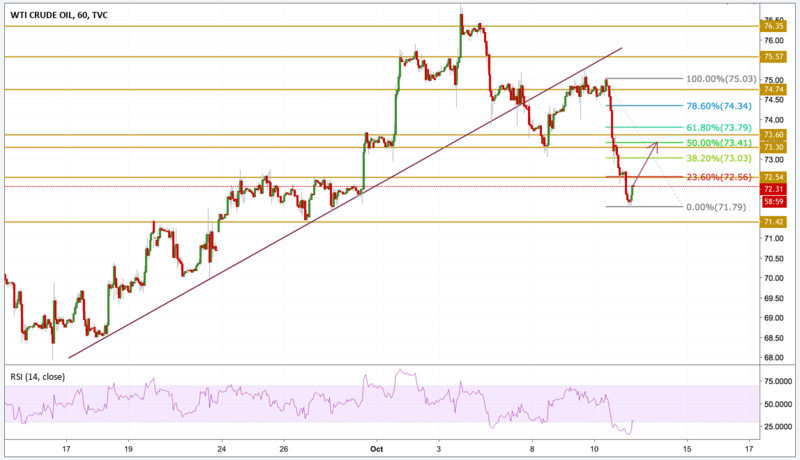 The black Gold lost momentum and entered into a deep oversold state as we can see on the RSI and the prices are now looking for an upward correction after climbing back above the $72 level. If they manage to break above the $72.6 resistance level, then we will be focusing on $73.40 resistance level which also coincides with the 50% Fib level.